The history of hot cross buns (with a side of music)! I am extremely fond of hot cross buns. It is my favourite food item during Easter – even more than chocolate eggs, which is really saying something. Maybe it’s because Easter eggs are made of chocolate, and I eat a little bit of chocolate every day, whereas hot cross buns are harder to find year round. A ritual I have on Easter weekends is to listen to either Renaissance choral music or something sprightly like Vivaldi, make some coffee, and listen while I savour the buns. Some have icing sugar forming the cross marks, which I find too sweet – I prefer the crosses made from the dough. The origins of hot cross buns go back centuries, and no one is quite sure how the Easter treat became standard fare. We all know the cross on the top represents the holy cross. 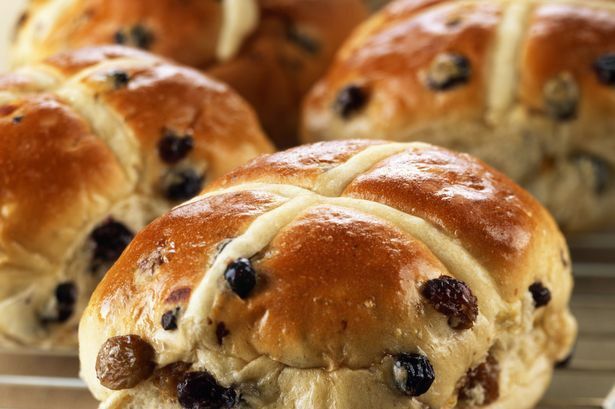 English folklore includes a few superstitions, such as the buns baked and served on Good Friday will not spoil or grow mouldy during the subsequent year. Another encourages keeping such a bun for medicinal purposes. (I totally agree.) A piece of it given to someone ill is said to help them recover. (I agree with that, too.) If taken on a sea voyage, hot cross buns are said to protect against shipwreck. If hung in the kitchen, they are said to protect against fires and ensure that all breads turn out perfectly. The hanging bun is replaced each year. Below are two lovely musical selections – the first, reflective (listen to it through your earbuds if you’re an early riser and don’t want to disturb the house). It’s a Lamentation for Maundy Thursday. This is the Christian holy day falling on the Thursday before Easter. It commemorates the foot washing (Maundy) and the Last Supper with the Apostles, as described in the gospels. The second selection is taken at quite a clip. I love Vivaldi’s Gloria, which I was lucky enough to sing in university and tour around BC. It’s an incredibly joyful hymn of praise and worship divided into 12 movements, ranging from festive ebullience to profound sadness. This one you crank up loud as the coffee percolates, calling out to your cohabitants to wake up. Enjoy, and happy Easter!